Lu Cong and Nate Ronniger are two contemporary artists making their mark in the world. Cong paints stunningly emotional portraits with dramatic lighting, while Ronniger creates imaginative theatrical sets that put a spin on the traditional notion of still life painting. Their paintings, while vastly different, represent some of the best in contemporary realism, a revolution that redefined modern art. 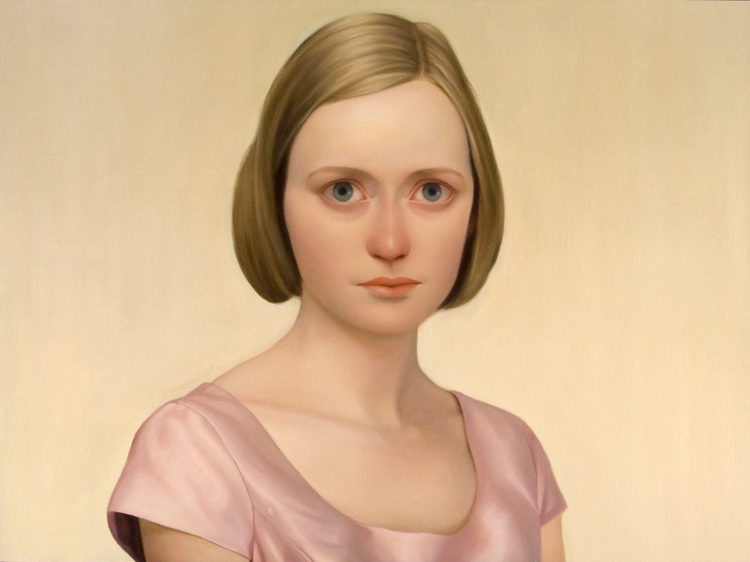 Originating in the late 1960s and early 1970s, the age of “contemporary realism” introduced a straightforward, authentic representation of images. The term is ambiguous, incorporating a diverse group of artistic talent. Little abstraction allows contemporary artists to create a uniquely strong visual impact. Despite the freedom this style endures, contemporary realists share a passion for the traditional approach to form and composition. Like many other artists in this genre, Cong and Ronniger first started their promising careers with a foundation of abstract and impressionistic works. Notable evolutions show how Cong focused his efforts on perfecting his signature portraits, and Ronniger expressed his talents through intricate landscapes and everyday objects. With their professional training, each artist has masterfully developed the incredible techniques we see today. Cong has been named as one of “Twenty Artists to watch under the age of 31” for Southwest Art Magazine and one of five for “Today’s Masters Making Their Marks” by Fine Art Connoisseur Magazine. Similarly, Ronniger, who started as a graphic designer and illustrator, has won numerous show awards. Most recently he was hand picked by John-Paul Philipe to assist with completing the interior artwork at Barney’s department store in Scottsdale, Arizona. Ronniger is quickly making a name for himself with his playful sets and signature design elements and was also named one of “Twenty Artists to watch under the age of 31” for Southwest Art. These two extremely talented artists have teamed up to produce one unforgettable show “Bolding Facing Life,” which showcases each artist’s magnificent imagery. The combined collection of Cong and Ronniger uniquely compliment each other’s mesmerizing style. Cong debuts a series of compelling, realistic portraits. His love of painting people originated as a young child. According to Cong, “Portraits have a spell over me; they speak to me in ways that I cannot recount. They bring me closer to fulfilling that indescribable craving.” This nostalgic feeling vaguely lingers throughout each piece in his collection. 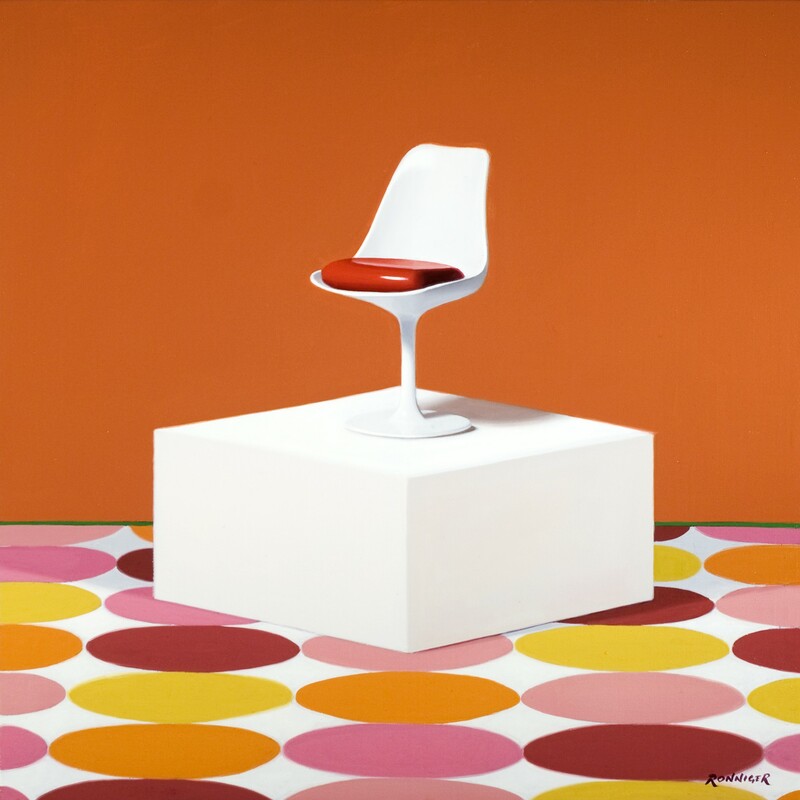 Ronniger introduces intriguing contemporary design through still life depictions of toys, chairs, and elements of paper. He views himself as a director, striving to portray comedy and drama simultaneously throughout his paintings. Simplicity is his primary objective. Ronniger uses a spotlight to create shadows and contours, emphasizing his dramatic clean lines and powerful symmetrical patterns. His latest collection includes works inspired from the Design Interior Collection Vol. 5 showcasing mid-century modern chairs from prominent designers such as Arne Jacobson and Charles and Ray Eames. BDG: Who is your personal mentor or hero? BDG: What is the one thing you can’t live without? BDG: Aside from painting, what is your favorite pastime? Gail Morris’ opening “New Horizon’s” is tonight from 6-9pm at Bonner David Galleries (map). You can read her feature article in this month’s issue of American Art Collector (Gail Morris-AAC March 2010). For more information about her work and to view a complete catalouge of available paintings please contact us at 480.941.8500 or by email at art@bonnerdavid.com. 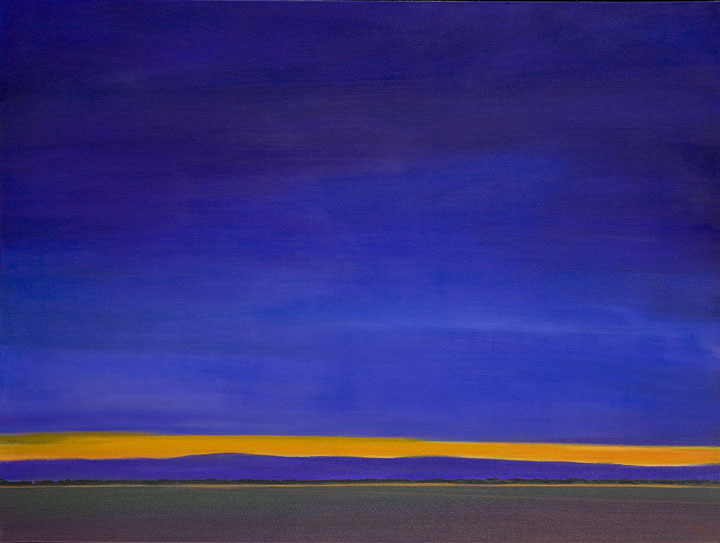 New horizons are exactly what renowned abstract landscape artist Gail Morris experienced as she traveled around the world this past year. Her journeys led her to countries such as Sweden, Japan, Fiji, and Holland. Now she is coming to Scottsdale to share her worldly expeditions with Bonner David Galleries, and we are so excited to welcome her back! Morris’s soft, colorful panorama depictions are always breathtaking. Her latest collection “New Horizons” leaves us completely awestruck. Contemporary, yet traditional, her effortless brushstrokes and lines evoke emotions reminding one of the true essence of nature. Morris’s passion for painting evolved from her previous work as a photojournalist. Her inspiring artistic talent was revealed after studies with mentors in Haiti and collaboration with other accomplished artists in the U.S. She has been awarded numerous prizes for her participation in juried shows and continues to astonish all who view her remarkable landscapes. Her unique style captures the interest of collectors worldwide. Morris’s newest compilation “New Horizons” encompasses her travels abroad. As an environmentalist, Morris emphasizes the fresh, natural beauty of scenery by leaving out any man-made structures from her canvases. In “New Horizons”, she explores different standpoints by altering her point of view from standing on land to floating on a boat, flying on a plane, or swimming in the ocean. This master colorist enhances her palette by saturating bright, complementary shades that truly encapsulate the exquisiteness of each serene vista she paints. Morris’s signature style is founded on her uncompromising balance between realism and abstraction in order to portray nature at its finest. This concept is reflected throughout her entire collection, which showcases scenery such as grandeur landscapes in Europe and stormy skies of Hawaii. We were determined to speak with the creator of these elegant paintings to shed some light on her journey around the world and about “New Horizons”. Here is what Morris shared with us! Bonner David: Do you have a motto you live by? Morris: Strive to capture, and find, the beauty in the moment. (And never take “no” for an answer). Bonner David: What is the last book you read? Bonner David: What’s the most interesting meal you ate while traveling abroad this past year? Morris: Our Japanese friends took my husband and I to a lush and expensive sushi restaurant located in the mountains several hours from Tokyo. We were taken with great ceremony to a small private tea house that was built over a meandering stream. There were beautiful koi fish swimming underneath us. When the first plate came, we saw a very thin and transparent piece of fish on each white plate. It was carp (a.k.a. koi). Next, we had land snails. We eventually understood that everything that swam or crawled on the property was being served to us. We had about 4 oz. of food in 4 hours, but there was “100 year old frozen sake” to wash it down with, so the 3 hour drive back to Tokyo was pretty relaxing. The land snails still worry me. 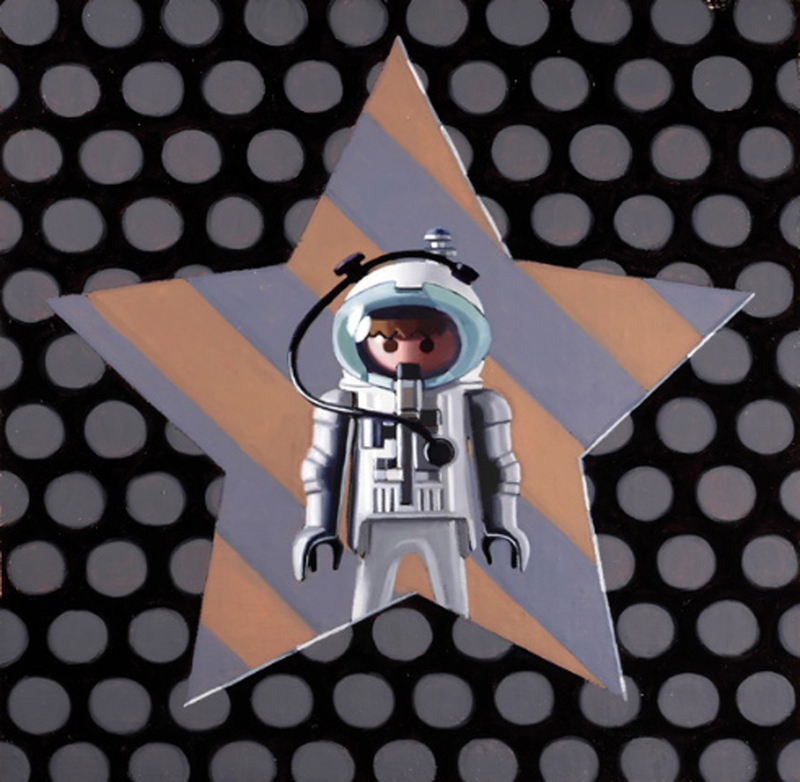 Bonner David: What place had the biggest influence on your new collection and why? Morris: The Pacific Ocean. From California to Japan. I painted the fog and coastal grasslands in California, the dry volcanic vistas and stormy skies of Hawaii, and massive sunrises and brilliantly clear waters of Fiji. I am still working on some aerial views of the ocean which are very challenging. These should be available at Bonner David in the early autumn. Bonner David: What emotions do you wish to evoke from your audience with your new paintings? Morris: Something peaceful. The feeling that there is a story just below the surface of the painting. A sensation of slipping in and out of dreams, going from Beta to Alpha brain waves. I play with thinned paint and many layers of color to create this subtle interplay. That is why I like big skies, a big ocean, fields of grain, and vistas bisected by a horizon line that keeps everything grounded. My paintings always begin with a real place. Then I deconstruct many of them into shapes and colors. My ideal painting keeps this balance and allows each viewer to float into their own free association and creative emotions. I am not presenting intellectual challenges but I am proposing emotional and meditational ones. Bonner David: The best advice anyone has ever given you? Morris: I have received so much good advice in my lifetime. Much of it from my husband Jim and my own children. However, when I was about 24 I met my hero, HENRY MILLER, (“Tropic of Cancer”) at his home in Pacific Palisades. We became friends for several years. He told me to write about, and paint about, the things that I loved, and to never be afraid of what people might think or say about me. He gave me one of his books called “To Paint is to Love Again.” When I became a full-time artist, I began to really understand that title. To paint is to love again. 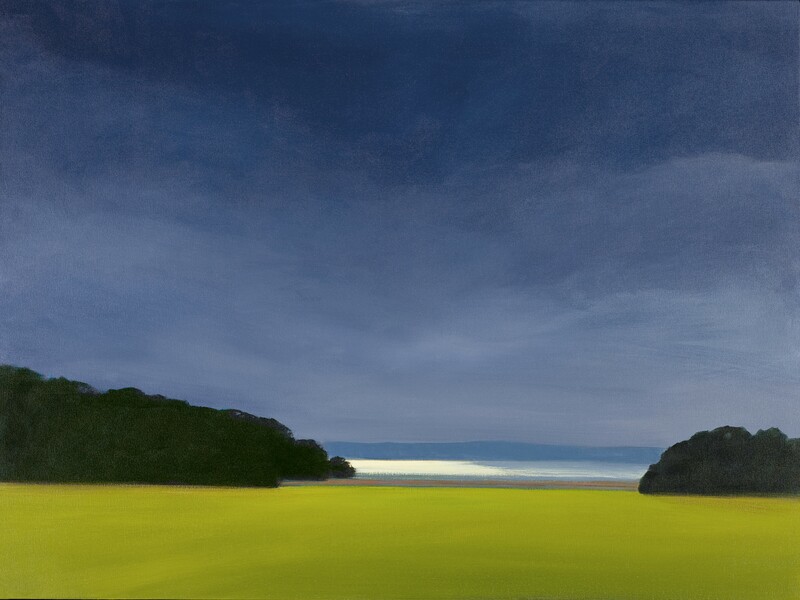 The opening reception for Gail Morris’s stunning collection “New Horizons” will be held at Bonner David Galleries (map) on March 11, 2010 from 6:00 pm to 9:00 pm. We look forward to a lively show with this master colorist and hope you will celebrate her extraordinary art with us! To read her full bio and view a complete collection of Gail Morris’s work please click here. If you would like to receive more information about Gail Morris or to obtain a preview of the upcoming collection please contact us at art@bonnerdavid.com or call us at 480.941. 8500.